Posted by Ben Jardine on 10 January. One of the big hesitations for people who are thinking about taking the leap from a permanent job into freelance work is the idea that they’ll somehow lose the structure that a traditional nine-to-five offers. But as more people join the ranks of the freelance economy, shared spaces that provide that necessary framework and sense of community are becoming more common. The world of freelancing is more wide open than it’s ever been and coworking spaces are there to help you gain momentum. More and more people are discovering the joys of a flexible work schedule: clients you can choose and the freedom of moving from contract to contract. Coworking spaces, those places in which freelancers, entrepreneurs, small businesses, startups, and sole traders can gather with no corporate umbrella to dictate how they allocate their time, are on the rise. In Wellington alone there are a handful of spaces specifically designed for freelancers; spaces where you can work (for yourself, of course) alongside other like-minded individuals and share creative ideas and methodologies. Most coworking spaces are set up for individuals and small businesses, though some even cater to more mid-sized startups. For those wanting to leave their “work-from-home” situation for a more structured environment, a coworking space is the perfect next step: designed for your needs, affordable, and ripe with inspiration. Because coworking spaces are so full of varying businesses and creative ideas, often times you’ll receive motivation of some kind, and support, from the people who work in close proximity to you. As opposed to working from home, coworking spaces offer a vast array of resources that can help you solve challenging problems, build your network, and grow your business. So What Do Coworking Spaces Offer? Most coworking spaces provide individuals with all of the necessary workplace requisites: a desk and chair, wifi, a printer/scanner, coffee and tea. Some, however, offer some really cool features to make your workspace that much more unique. Movers & Shakers, located in the Britomart area of Auckland, has a “30ft inflatable braincell” where people can work; Petridish, a shared office space in Dunedin, features murals painted by local artists. Most coworking spaces understand the need to build a community of people who share common values. So these spaces will organise training events and talks geared towards the future of work, the nature of freelancing and contracting, and other innovative topics. 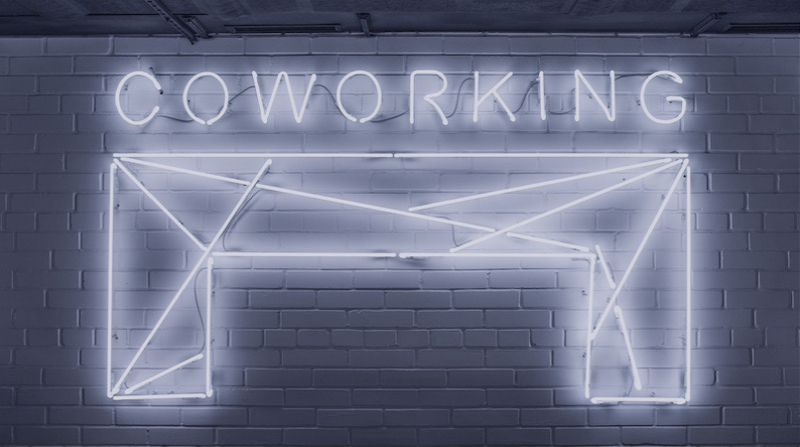 With the increasing popularity of coworking spaces, we’re also starting to see larger companies collaborate with these spaces in order to build an even more diverse community through public forums and workshops. Some coworking spaces look like the inside of the bedroom from 2001: A Space Odyssey, while some offer a more rustic feel with fine wood finishes and exposed brick. Some coworking spaces are loose, warm networking hubs (such as Exchange in Christchurch), while others offer business development programmes, such as Ministry of Awesome (also in Christchurch). Some coworking spaces are also attached to accelerator and investment programmes (The Ice House), so that you can get sound business advice for your creative ideas. These coworking spaces allow you to grow your startup or entrepreneurial business as you wish. Of course, the pricing models of these coworking spaces vary greatly. Depending on the type of coworking space (eg, what services and amenities it provides, and how futuristic the interior looks), you can be paying as little as $20 a month or as much as $500 a month (prices not including GST). Some coworking spaces even offer free trials so that you can get a feel for the place, before you even spend a cent. High-Speed Internet: this almost goes without saying, but you can’t do much without Internet. No one wants to work in a space that has a poor connection; it will frustrate you and that isn’t good for workflow. Location: how far from home is too far? If you’re giving up the “work-from-home lifestyle” you won’t want to have to travel across town to work in a space that might end up costing $200/month. Moreover, the space itself is important: can you work at a chair all day or do you need a stand-up desk? How many people around you is too many? 24/7 access: perhaps this isn’t high up on your list of priorities, but it can really hinder your work if you’re trying to reach international markets and clients where their work hours don’t quite align with your own. It’d be a pain to get locked out of your coworking space once the clock hits five. Events/Community: given the steep pricetag for some of these coworking spaces, you want to feel like you’re getting some extra perks with your monthly payments. Most spaces offer after work events, but some also offer guest speakers, workshops, and seminars. An important thing to keep in mind is that, in this case, cheap doesn’t always mean better. At a lot of these coworking spaces, you often get what you pay for. As the freelance economy takes flight, expect to see more coworking spaces pop up all around the country and beyond. For now, here’s a list of our favourite coworking spaces in New Zealand. So Where Are New Zealand’s Coworking Spaces? BizDojo Auckland (three locations), Wellington (two locations), and Christchurch (two locations) Qb Studios Auckland (three locations), and Christchurch (two locations) Regus is a global network of coworking spaces, with locations in Auckland, Wellington, Christchurch, and Dunedin. FabLabs: a resource for makerspaces and hands-on creative spaces. As is the nature of the gig economy, co-working spaces come and go with the change of the wind. Be sure to check back here frequently for updates on your favourite spaces and new ones that might better suit your needs. We reckon this list will help you more confidently take The Leap into fulfilled freelancing: even popping into one of these spaces might do you a world of difference. If we’ve missed one of your favourite coworking spaces, or if you’ve got ideas about what else you want to see, don’t be afraid to reach out. And if you’ve got some tips on finding a space, we’d love to hear from you too!